Boost your heart rate, improve your flexibility and relieve stress with our low-impact walking program in a safe, climate controlled environment. 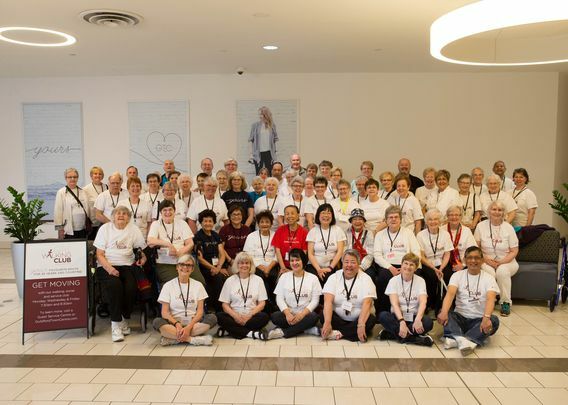 Our walking club will help you stay active throughout the year, with warm-up exercises, group walks and cool-downs; all led by a certified fitness instructor. So what are you waiting for? Discover mall walking at Guildford Town Centre and get active! The club also hosts many social events such as breakfast events, picnics and themed walks including the Easter Bonnet Walk, Halloween Howl and Jingle Bell Walk. Please enter the centre from the north side through Entrance 8 or 9 by BC Liquor Store. Meet the group on the upper level near Urban Behavior. Adults of any age and fitness level. Each session is 50 minutes and includes a gentle routine of warm-up and cool down exercises and stretches. Your first class is free. After your first class, register and pay a drop-in fee of $1.50 or purchase a 10-session passport for just $10. On completion of your first passport, you will receive a free walking club t-shirt. A Certified Health and Fitness Consultant and Registered Personal Trainer, your instructor is highly experienced and able to assist all participants with their specific needs ensuring you get the most out of your workout. Wear clothing that is comfortable and appropriate for exercise. Proper walking shoes are recommended. Assistance in this area is available from your instructor and the many footwear retailers in Guildford Town Centre.